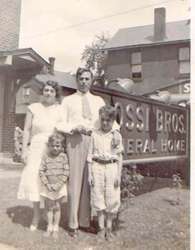 Rossi Brothers & Lellio Funeral Homes have established a strong tradition of compassionate funeral service and active community support to the Youngstown area since opening in 1919. A proud member of the community, the first location opened at 116 E. Wood Street, north of the downtown Youngstown area. Louis Rossi Sr., already licensed as a funeral director, traveled from New York to establish the business that expanded quickly. A new, larger location was constructed at 650 Himrod Avenue to allow the Rossi family to appropriately serve the grieving families of the area. Rossi Brothers gained support and respect with the attention to details and sincere services to those in need when losing a loved one. As quoted in the Youngstown Telegram in the June 16, 1925 Grand Opening Announcement, "A splendid record, indeed. It merits and bespeaks for Rossi Brothers the favorable consideration of anyone requiring the services of men of their profession." 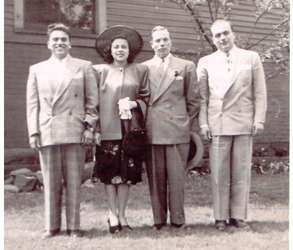 The family traditions of service continued to expand as sons Armond V. Rossi and Louis G. Rossi became licensed funeral directors/embalmers for the funeral home in 1947 and 1950, respectively. Professional services were complemented by community involvement in many local organizations as the business established a strong commitment to the families they served. The funeral home location changed again in 1942, when the business relocated to 682 Wick Avenue, the former Wick Mansion, where families were pleased with the refined surroundings provided for their services. 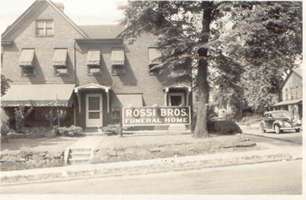 Rossi Brothers Funeral Home rema ined here until construction of local expressway roads prompted the Rossi Family to allow the land to be used for development. Once again, construction of a new location was undertaken. The current facility at 4442 South Avenue is the result of careful design and planning for family needs during services. Completed in 1966, the funeral home offers families convenient access, large gathering rooms, and pleasant surroundings. The next generation of Rossi family has joined the tradition of service and community commitment as Ursula Rossi-Lellio and Frank J. Lellio Jr. acquired ownership of Rossi Brothers Funeral Home in 2000. The daughter and son-in-law of the late Louis Rossi Jr. have committed themselves and the staff of Rossi Brothers Funeral Home to continuing the level of sincere service historically provided to our families during difficult times. In early 2012, Louis Rossi's twin sons, Joseph and Louis Rossi joined the firm to continue the compassionate care that their father and uncle have shown area families. Together, they are following a family tradition of three generations of COMPASSION, CARE, & COMMITMENT.